We started out at the Sunrise Service at the Long’s House at 7:00am. It was a half an hour later than last year. The weather returned to overcast conditions two years ago in contrast to the sunny warmer with a gentle warm breeze last year. However, there was a nice glow of the sunrise along the river for much of the service. St. Peter’s had some key roles. Catherine preached. Nancy provided the welcome and Alex the opening prayer and Apostle’s Creed. Shiloh brought their band as they have in former years. The three ministers met after the service and planned a meeting to talk about security. We started out at the Sunrise Service at the Long’s House at 7:00am. Easter is a time of celebration and that included music. Andy Cortez also had accompaniments written for the opening hymn “Christ the Lord is Risen Today” and the closing “The Day of Resurrection. The choir sang “O sons and daughters let us sing” at the offertory. We had 70 in attendance, an overflow helped by several families. The church was adorned with lilies. Charles contributed Calla lilies which we had outside. The full Holy week page is here with all the Holy Week related scriptures and services. From Palm Sunday to Easter, 2018 we held 5 services this year, serving 155 people. There was a special Maundy Thursday event for the tailer court in Port Royal as well. The services varied as well as mood – Psalm Sunday with the procession, the darkness and shadows of Tenebrae, the communal footwashing of Maundy Thursday, the the cup of salvation of Good Friday and then the wonderful celebrations of Easter day. We also participated in the Port Royal Sunrise service on Sunday morning. Yes, we did walk with Jesus in his suffering and hardships and then sharing and proclaiming the resurrection. with all the Holy Week related scriptures and services. 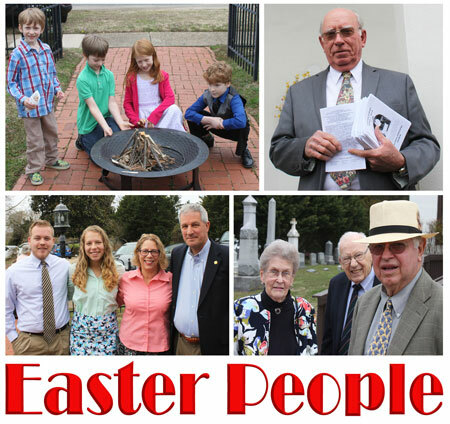 From Palm Sunday to Easter, 2018 we held 5 services this year, serving 155 people. There was a special Maundy Thursday event for the tailer court in Port Royal as well. 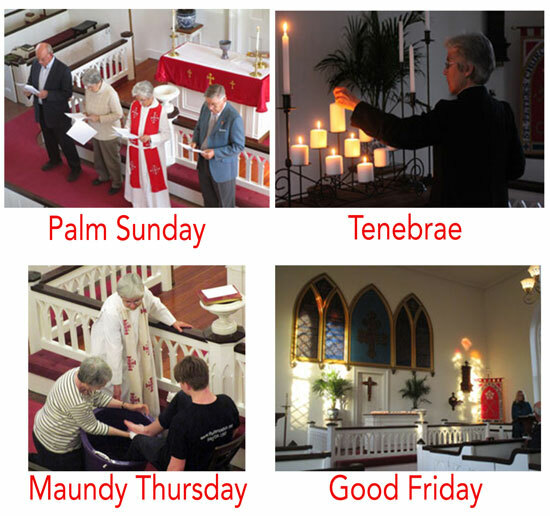 The services varied as well as mood – Psalm Sunday with the procession, the darkness and shadows of Tenebrae, the communal footwashing of Maundy Thursday, the the cup of salvation of Good Friday and then the wonderful celebrations of Easter day. 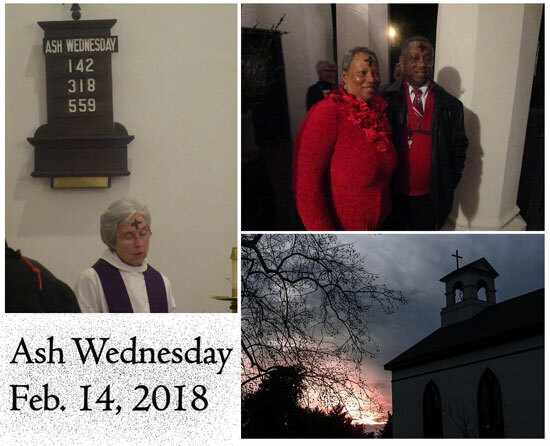 We also participated in the Port Royal Sunrise service on Sunday morning. Yes, we did walk with Jesus in his suffering and hardships and then sharing and proclaiming the resurrection. Before we get to the amazing story Palm Sunday and Holy Week, it is worth to pause on the effect of weather on this first week of spring. 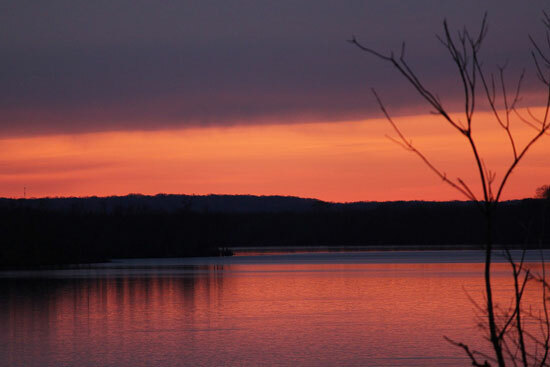 The week started with a spectacular sunrise on Monday, March 19. A good sign to lead to spring but spring never showed its face this week. 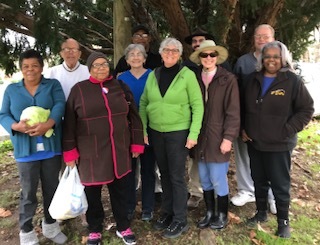 Yes, we had planned a full first day of spring March 21- Bible Study at 10am, preparation for the Village Harvest, our food distribution, which was scheduled from 3pm to 5pm and then continuing the Bible study on Revelation at 6pm. There were more disruptions. Last week and this week the interior of St. Peter’s was painted. The sacristy was cleared on Sunday and painting ensued. An emergency crew came in on Thursday to recover the church so to be ready by Sunday. The place was a mess! Adding to the difficulties was that the weather was not spring-like with a strong wind making it that much colder. We began our observation of Jesus’ death and resurrection by preparing for Easter with a season of penitence. Ash Wednesday is the first day of Lent. The imposition of ashes follows the invitation. At this service, 18 received ashes on our foreheads in the shape of a cross to remind us of our mortality, and complete dependence on God for our lives. Only through God’s saving grace can be we be in a relationship with God. 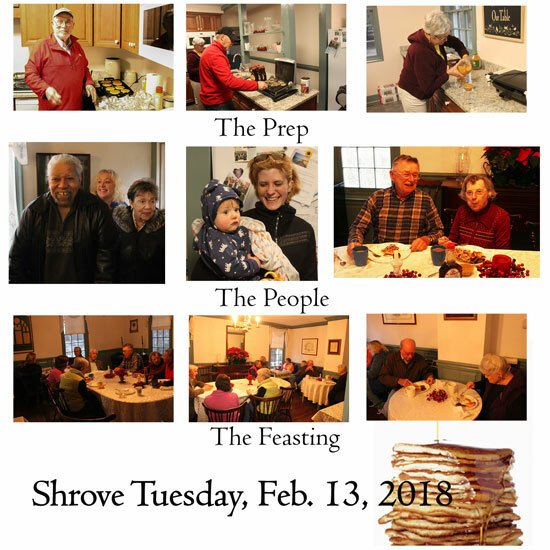 Shrove Tuesday is the last day of Epiphany and the bridge to Lent which begins Wed. Feb. 14. Shrove Tuesday is a day of reflection but mostly feasting. And we did that with about 20 in the Parish House. For a variety of reasons – renovation, Village Dinner, weather we have not had one since 2013. Thanks to Dave, Eunice, Roger, Andrea, and Catherine for helping out preparing and serving and making this day a reality once again. 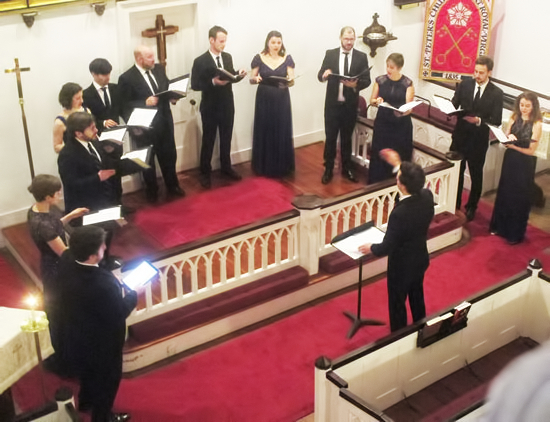 The Thirteen was our first concert almost five years ago in Oct. 2013. We brought them back to help begin our sixth year. Many things have changed with them including singers though they still have two singers from that period. Many of their concerts, including this one, are thematic. This concert, “From Tree to Shining Tree”, was based on the environment and how composers have expressed their feelings – wonder, delight as well horror to the destruction of nature through their music. We had 50 people on a pretty dreary day though the music lightened it up. The rain held up and it was very warm in the 60’s in February. We thank the Heimbachs for a wonderful reception at 6pm including drinks, cheese and crab dip. Also Brad Volland provided two types of lasagna at dinner which was appreciated. Thanks to others such as Roger and Eunice who helped with the dinner and logistics. Catherine took a group to visit this impressive exhibit, a traveling Smithsonian exhibit at the Fredericksburg museum. It runs from Jan 28 through March 11. We take it for granted, but how much do you really know about it? A literal flood of information on water was presented – how it is so necessary and how we both use and misuse this resource. So much that it will be easy to come back. The guides were knowledgeable and demonstrated much of the information to make it memorable. The central theme of water in many of the world’s religions was particularly notable. 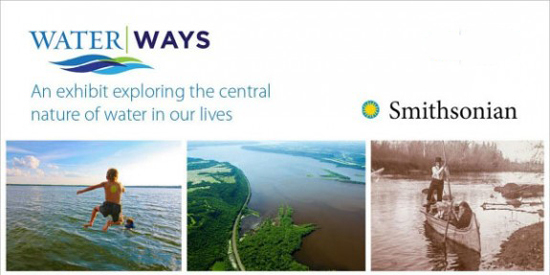 Fredericksburg was literally built on the role of the Rappahannock River. Christmas Eve turned cloudy in the mid-40’s with rain later. We had 51 for the service. 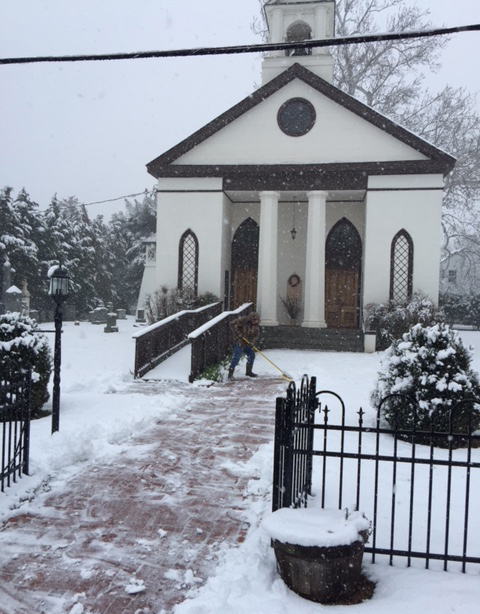 Of note within the church were “cherry tree toppers” used as ornaments toward the rear of the church from Fraser Wood Elements in Fredericksburg. Cookie outdid herself with the poinsettia in the windows with nandina and pine. The red candles complemented them well. Music is part of Christmas. Marilyn brought her harp and Nancy joined in on soprano for one piece. 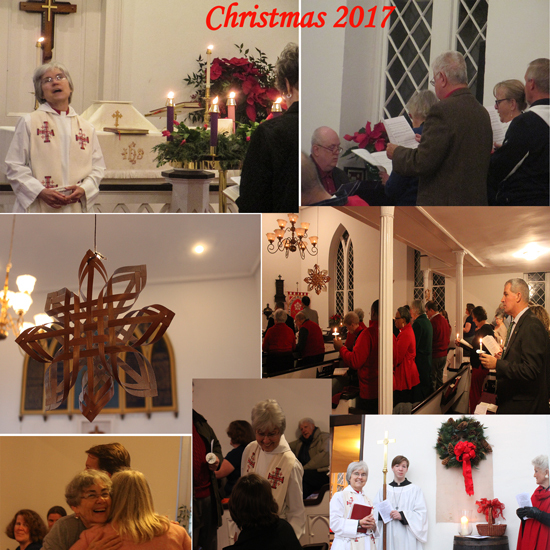 The choir presented “In the Bleak Midwinter” at the offertory. Brad’s prelude was “Unto to us a child is born.” We normally sing “Angels we have heard on High” but it was the postlude this year. We had numerous visitors. Cherry had her “hugging shirt” and she was busy doing that. Catherine presented Luke 2 reading for memory as well her sermon. We have a selection from it under the videos. The intimacy of St. Peter’s gives everyone a front row seat. The story of William Weaver and the stolen bike brought all into several themes of Christmas in the sermon. Today was Advent 3 but for St. Peter’s better known as the Christmas Play. This play was different than in the past. It was exclusively performed by children but this time with speaking lines rather than involving the adults with the speaking parts. The play was inserted in the service rather than the service inserted into the play. This year Advent 4 and Christmas Eve are the same day so Advent seems shorter. Thus, the decision to make it an Advent 3 Sunday as much as the play. The play was written by Catherine around the Gospel reading for this Sunday starting with John the Baptist. It continued with a mixture of the traditions from Luke and Matthew. 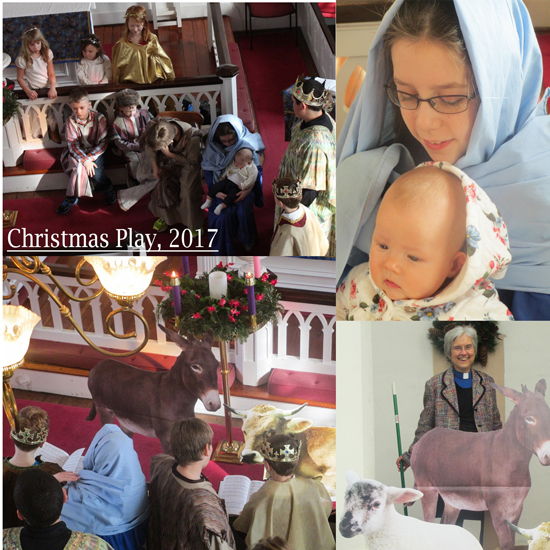 We had 58 people in the service including 11 children in the play. Becky Fisher as the director deserves credit for rehearsing the children over several weeks with their lines, organizing the costumes and getting the PA system. The props had to be purchased and blocking had to be done. 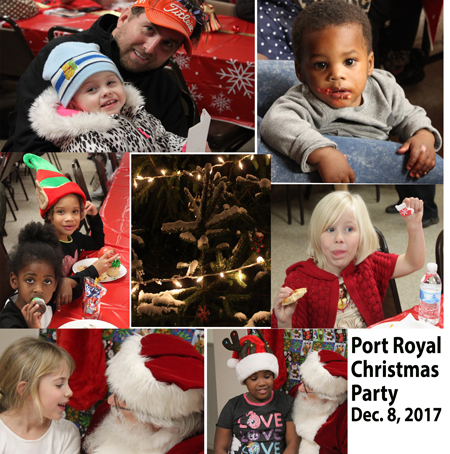 The Port Royal Christmas had probably 75 people there, less attended in previous years. Snow was coming down as the party began and predictions for Saturday were anywhere from 1-3 inches. However, the outside tree which was planted many years ago showed the splendor of Christmas and the numbers that were in attendance had more time with Santa. 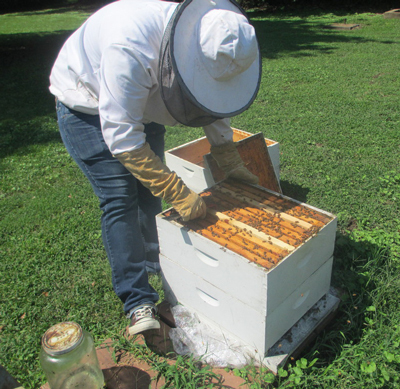 There were three groups collaborating for this event – Town of Port Royal, Parks and Rec, St. Peter’s Episcopal. St. Peter’s took care of the pizza and Town of Port Royal the sweets. St. Peter’s also helped with the serving and support. Catherine helped to organize the group and provided fellowship. Johnny Davis and Jim Heimbach served pizza. Nancy and Elizabeth were in the kitchen. Andrea provided the desserts. Families from St. Peter’s who enjoyed the evening included the Davis’ and Dukes. We celebrated our 3 year anniversary of our food ministry, the Village Harvest in a big way by serving 191 people on Nov. 15. What a birthday! This is a new monthly record and up from 170 the month before. This provides even more focus on building financial support, particularly on #Giving Tuesday. We gave out all 1,600+ pounds of food including chicken, peanut butter, tuna. potatoes squash, cabbage and cereal. canned vegetables and grapes. Through Nov, 2017 after 3 years we have served 4,187 people, 33,934 pounds of food. That’s 8 pounds a person or market value of $48 each month a client comes. FREE! 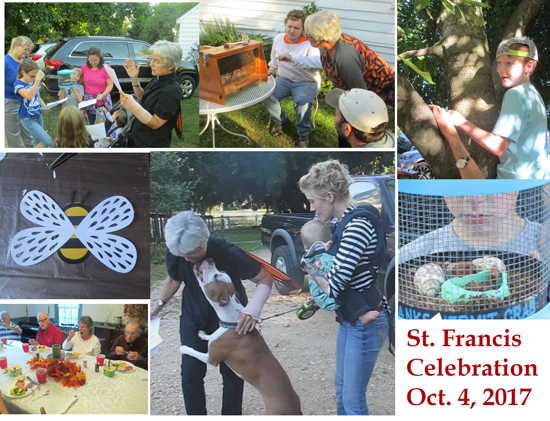 This was a different St. Francis Event, 4pm-6pm, Oct. 4, 2017. In the past we have had the service around the Blessing of the Pets. In other years at Charter Day we gave out treats and had some blessings. The link to the story is here. This year we had a variety of activities – art, a scavenger hunt, the blessing and then following it the Village Dinner. Thanks to all who participated in particular for Susan Tilt’s art project, Andrew Huffman for his wonderful explanation on our bees and for gathering the bees in a separate glassed container so all could see, Catherine for the scavenger hunt (for both children and adults), the helpers with the Village Dinner and of course those who brought their animals. There was much more diversity from just having dogs. We started the Season of Creation Sunday, Sept. 3, 2017, five weeks in the middle of Pentecost that focuses on our relation to God and the environment. The Season of Creation is an optional liturgy in the Episcopal Church. We had different readings readings and a different Eucharistic prayer – “We Give Thanks”. It highlights the role of God as Creator and Jesus dwelling in nature as one of us to bring us abundant life. There were five Sundays in the season. The link to the Sunday is here. It made it real with Hurricane Harvey devastating Houston, Texas, the 4th largest city in the US. We are collecting funds for its relief. As part of that, an anonymous donor has pledged to match the first $1,000 of donations. Thus we plan to send Episcopal Relief a check for $2,000 in the minimum. Transfiguration Sunday. Rarely Transfiguration is on a Sunday. Another beautiful, relatively mild Sunday for August. 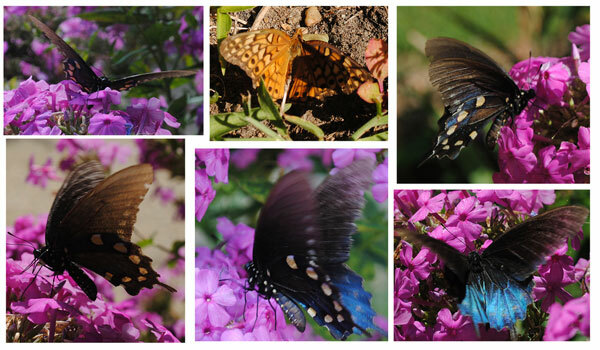 The butterflies were out in mass. This Sunday we welcomed Jeffri Harre as preacher. Jeffri is the Director of Hospitality at Virginia Theological Seminary and friend of Catherine’s. He is currently working on an MA in Christian Education and is also a spiritual director in Northern Virginia. Jeffrey talked about Jesus’ prayer habits. He often went alone to pray in the mountains or with his disciples. Rarely is he delivered from unease. In former passages he prays and then feeds the 5,000. On Maundy Thursday he prays and is arrested. Prayer grounds us and allows us to discern our own ministry. Prayer strengthens us for the tensions of the world that we are bound to experience. But be careful what you pray for. You may be transfigured which is a change of form to a more spiritual state.